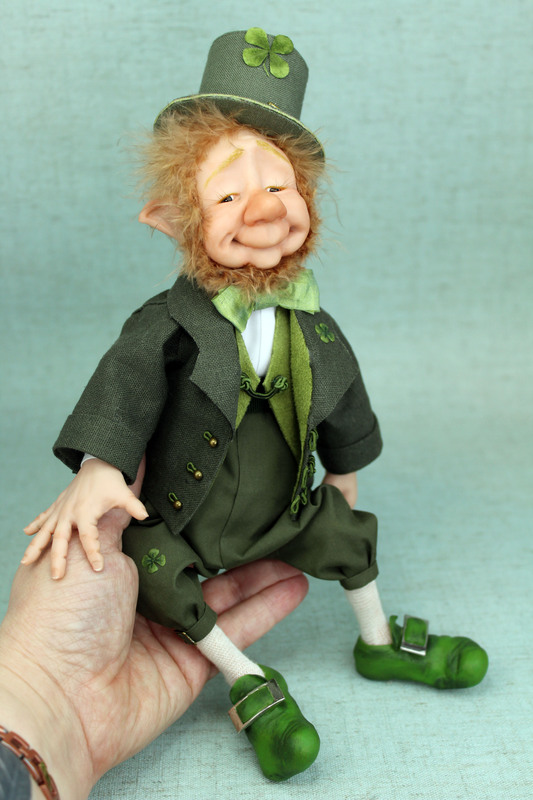 As part of Irish mythology and folklore, the Leprechauns are part of our faerie folk, called by some as the “The Wee Folk”. They are said to be small enough to sit comfortably on your shoulder, they are smartly dressed with waistcoats and buckles on their shoes and hats. They are mischievous little folk, but they are protective beings who love their owners and take care of them in any adversity and it is said that every Leprechaun has a pot of gold! This lucky little fellow has his very own stash of gold (pyrite), hidden inside his genuine red Wade Porcelain Whisky bottle. Our little fellow here has had a wonderful night out, he has been drinking his whisky, but is still very much smiling as he has not lost his stash of gold or his unopened tiny bottle of Whisky. This lucky Irish Leprechaun measures a proud 30.5 cms (12.25 inches) from the base of his mushroom seat to the top of his hat, and 20 cms (8 inches) when he is sitting on a shelf or in your hands. His handmade mushroom is 11 cms (4.25 inches) and has hidden magnets inside which holds him sitting on his seat perfectly. He is a polymer clay creation with weighted glass granules in his stockinette body, which allows you to arrange him in several poses. He is very soft and squashy and can bend at his waist. His arms and legs can bend and his wobbly head can turn from side to side. His arms and legs are floppy and dangle, just like a real little drunk man! He has such a gentle little beguiling face with the softest expression that will melt your heart and make you want to hug him. He has big fat sturdy shoes which dangle from his mushroom seat and his attire is pure linen, cottons, luxurious taffeta silks, hand embroidered buttonholes and metal buckles. His jacket and waistcoat are able to be opened and closed but they are attached so as not the be removed, I think he would prefer to keep his clothes and hat on! His bottle is a genuine red Wade Porcelain Whisky bottle, with a removable ornate metal embossed cork stopper. Little Bashful Elflock Leprechaun has his very own handmade lucky four leaf clover on his hat, and a tiny handmade one on the lapel of his jacket, and another on the knee of his trousers!